One of my goals for 2013 was to deepen my practice and open my heart more fully to energy medicine and all things involving the intuitive arts. So of course when I heard about spoon-bending, I was intrigued! Was it quantum physics? I couldn’t wrap my mind around how this was physically possible, after exerting all my might into bending a small teaspoon I had in my drawer. Then I heard about Martha Beck and her spoon-bending workshop. Martha Beck talks about Wordlessness in her book, Finding your way in a Wild New World. It involves stilling our mind and going into wordlessness. Beyond words. Slowing our minds to connect that we are all one with the universe. She talks about not being limited by our thoughts. Or a limiting belief that metal teaspoons can’t be bent. I meditate everyday. There are days where I struggle to deepen into that stillness. In the least, I thought incorporating the 5 senses into my daily practice will help ground my mind into that quiet place. In her book, Martha suggested going through invoking the 5 senses and your favorite for each. Mary Ann Johnston, a fellow Marie Forleo B-schooler and Martha Beck Coach, led a teleclass on it, leading us through 2 guided meditations. After going through our favorites senses for each, we asked if the spoon wanted to “play” and if it does, gently put pressure on bending the metal. A favorite texture: the feeling of stroking the fur of the pups. Combining them all at once, flooding my mind so deliciously with it, this time I felt a lightness, and an explosion of pure energy running through me. I vividly recalled the warmth of the sun on my skin, the laughter of my daughter in the background and feeling the soft fur of my pups. It was the most peaceful feeling. The spoon bent. Something shifted deeply for me. I believe that we all have the potentiality for shifting our limiting beliefs into more positive ones. But somehow, we focus on all the stuff that is going wrong vs. validating the one thing we did…we talk about about our lack, whether emotional, physical, or financial. We do it informally over casual conversations with friends, or wishing we had more “x” or “y”. What we forget is that each time we think those thoughts, we speak these words out loud, we add to the focus of what we don’t want vs what it is we want. Growing up in a Chinese household, I was taught always to refuse compliments. Because that would have been boastful. It would not fit with being a dutiful little Chinese girl. What I’ve come to realize was this was my training for not receiving. From anyone. When the spoon bent, I was not focused on anything but JOY. Pure joy of what brought me such happiness. There was no pass or future. Nothing to measure against physically, financially. My “aha” was to simply focus on the FEELING of I wished for in my life vs. WHAT it is. 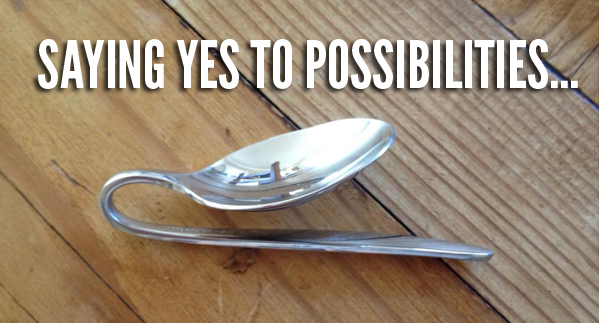 Spoon bending is about believing in possibilities. It is about surrendering to the limitations we tell ourselves. Where can you apply this in your own life? What is the FEELING you want to embody everyday? How can you apply this feeling to everything you do? Have I gone to crazy town? I don’t think so. But a week later, I am still giddy with delight about this little spoon that has reminded me about leaning into FEELING what I want my life to be, vs. on the goal line. I would LOVE to hear from you: What do you believe? Wow!! Amazing! I really want to give this a a go. What a mind blowing realization about the power of our inner feelings. Thank you for sharing this! I think I want to try this…!! This is a great way to prove that we are all connected at a molecular level, down to our thoughts. One thing I like to mention while teaching creativity, is that when we are tapped into our right brain hemispheres, we are connected to our present moment awareness, where an infinite source of energy also resides – so quantum physics come into play. It’s all so FASCINATING! Here is the link to sign up to get the free recording of the spoon bending tele class with the guided visualizations. Let me know how it goes, what you learned and email me a pic of your spoon! Copyright 2007-2018 Claire Chew Creative Coaching + Consulting, All Rights Reserved.